Regulations successfully defended in 2007 when challenged by the pharmaceutical industry at the Supreme Court regulate the promotion of foods for infants and young children up to three years of age as health officials attempt to prevent thousands of unnecessary deaths occurring every year. Other countries such as Brazil (where breastfeeding rates have increased markedly since a low in the 1970s) have introduced similar regulations in implementing marketing standards adopted by the World Health Assembly in 1981. A petition on the Avaaz site has already gained thousands of signatures and been reported in the Philippines. The Department of Trade and Industry (DTI), however, has publicly stated as it lobbies on the industry’s behalf that if the draft bill is not passed by Congress: “The proposed ban on advertising for milk products jeopardizes multinationals’ plan to invest $400 million”. Campaigners have already pointed out that elections for congress take place in 2013 and they have been hearing politicians warned that investment in their constituencies will be cancelled if they do not back the bill. Nestlé has formed the Infant & Pediatric Nutrition Association of the Philippines with formula companies Abbott Laboratories, Fonterra Brands, Mead Johnson Nutrition and Wyeth to lobby against the existing marketing requirements – yet Nestlé and other companies cite anti-trust regulations when called on to mutually agree to stop violations of the international minimum standards adopted by the World Health Assembly. (Nestlé announced on 1 December 2012 that it had completed its acquisition of Wyeth from Pfizer, though this was blocked by competition authorities in Mexico). This includes community health workers employed by Nestlé who have been found to promote infant formula door-to-door in the past. Company representatives visit health facilities distributing gifts and sponsoring health worker social events, such as choirs and trips to the beach. 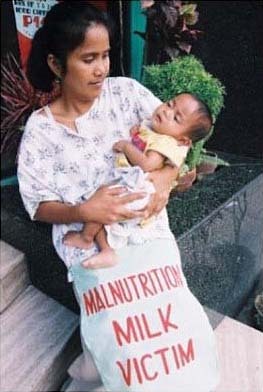 In 2007 UNICEF released a film called “Formula for Disaster” showing the reality of formula promotion in the Philippines and how parents are being misled into believing their children will be more intelligent if they are fed on formula rather than breastfed. Click here to watch it online or order a DVD from Baby Milk Action and organise a film and campaigning night. The US Chamber of Commerce directly lobbied the President of the Philippines in 2007, threatening investment by US companies if the Milk Code stood. An international campaign of solidarity effectively neutralised the threat then. 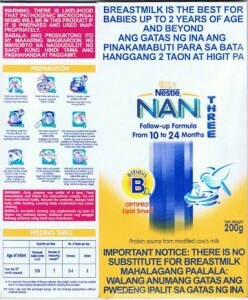 [Above: Clear warnings are required on Nestlé Nan formula under the 2007 Regulations. If Nestlé’s bill is passed, these will go, the labels will not have to be translated into Filipino and Nestlé will be able to advertise the products and directly target pregnant women and mothers]. In the 1990s Nestlé threatened to close down all operations in Zimbabwe if it implemented the International Code and Resolutions in legislation. The Minister of Health at the time, Dr Timothy Stamps, labelled this as “economic blackmail” and an “idle threat”. The law was introduced. Click here. 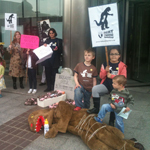 [Above: Children in the UK took on the Nestlé monster at a demonstration at Nestlé (UK) HQ on 19 May 2012. Photo copyright Baby Milk Action].